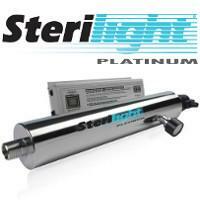 Platinum "SP" UV Water Disinfection Systems The Sterilight Platinum "SP" series from Viqua (formerly R-Can) has a range of 8 flow rates available from 15 to 52.0 USGPM. Each UV water treatment system comes equipped with an advanced electronic controller providing a universal power input (100-250V/50-60Hz) & visual display of system performance & lamp life. The Flow Pace™ sensor allows the system to operate with minimal power requirements & heat build-up. en higher flow rates). Applications include private water supplies, wells and lake water supplies, camp grounds, hotels, bottlers, aquaculture, hospitals, food, cottages, restaurants, breweries, water systems, laboratories, marine, pharmaceutical, dairies and more. The Platinum SP Series is loaded with features typically found in only expensive commercial UV sanitization units, yet it is available at a very economical price - in fact, many models cost considerably less than competitors' models and sterilight have far more features! The Sterilight Platinum SP Series is based on the feature-laden Platinum™ ICE controller and Sterilight's Flow-Pace™ UV intensity monitor. This combination allows for 2-stage flow pacing where the lamps operate at half power when water is not flowing and full-power when the water is running. This allows the system to operate with minimal power requirements (excellent for applications powered by solar power systems! ), at a lower operating cost, and with less heat build-up. The Platinum™ ICE controller provides constant output current and a universal power input (100-250V/50-60Hz), as well as visually displaying % UV intensity, remaining lamp life, and total hours of operation. The system comes with a set of dry contacts allowing for the external hook-up of a remote device such as a solenoid valve (sold separately - see below), as well as a self-diagnostic check upon start-up, and an RJ-11 communications port. 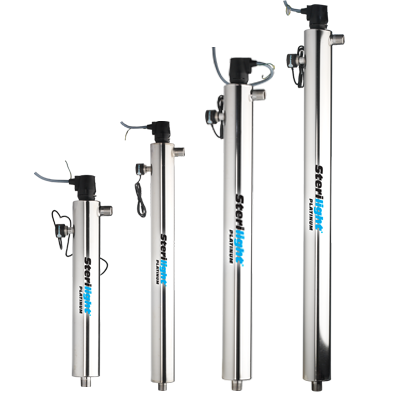 Using high-output, Sterilume™-HO coated low pressure germicidal UV lamps coupled with electropolished 316 stainless steel, axial flow sterilization chambers, the Platinum SP Series provides very high flow throughput capacity in a very compact system. The UV lamp provides a 4-log (99.99%) reduction of bacteria, viruses, and protozoan cysts (cryptosporidium and giardia) at the specified maximum flow rates. Lamp life is 9,000 hours (1 year). A suitable flow restrictor is also included to ensure that you do not exceed the maximum recommended UV dose. Specially designed and tested Sterilume™-HO lamps provide consistent and reliable ultraviolet output over the entire life of the lamp (9000 hours) to ensure continuous purification. The Flow-Pace™ UV Sensor promises system stability and long-life reliability with low power consumption, reducing operating costs and heat transfer into the water. The Sterilight Platinum power supply visually counts down remaining days until lamp replacement, provides total running time of controller, visually represents UV intensity output in % and conducts a full system diagnostic check on start-up. Axial Flow reactors include a patented axial flow system installed at the inlet – ensuring water confidence each and every time.